I love free! Who doesn’t?! When you consider how much of our own money we put into buying materials, prepping materials, and making sure our students have what they need to be successful, well free is a spooktacular treat! 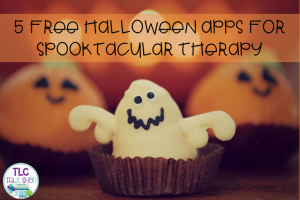 Here are a few free apps found through itunes that I have used in therapy. HALLOWEEN EBOOK by Visual Works: This is a very basic ebook introducing Halloween characters (mummy, vampire, etc) and is a simple way to work on answering basic who, what, and where questions. The great part is that you can also personalize the story for your student. The designer of this app also has similar ebooks for other holidays too (Thanksgiving, Christmas, Easter). If you go to their website, you can also download a pdf version of this story. MILLIE’s TRICKS & TREATS (Volume 1 & 2) by Megapops: These are not always free. However, throughout the year and as I am writing this, they currently are. They are super cute and provide live video of a dog doing silly things for and with bacon. At the beginning of each app, the student is able to choose their dressed up dog. You can work on making requests (which dog), descriptions (dog outfits, houses, doors), follow simple commands (knock on door, press the button), basic sentence formation (what is the dog doing?). Students can even make cards to email. CARVE-A-PUMPKIN by Parents Magazine: Students are able to work on description, requests, and following directions while carving a virtual pumpkin. FREE HALLOWEEN JIGSAW PUZZLES by SubZeroApps: These puzzles are very basic and great for little ones. The puzzles include whole picture matching pieces and puzzles of a simple item broken up in very few pieces (like the old wood or cardboard introductory puzzles for kids). HALLOWEEN STICKER BOOK by Peep Software- This is a great app to work on requests and following directions. Especially since some of the stickers that they offer have multiple sizes or other similar pictures. So students have to really listen to instructions to get the picture right. The opinions expressed here are my own and I have not received any compensation for sharing this information. All websites and tablet applications that are mentioned in this blog are done so as potential tools to encourage and assist in the development of speech and language skills. 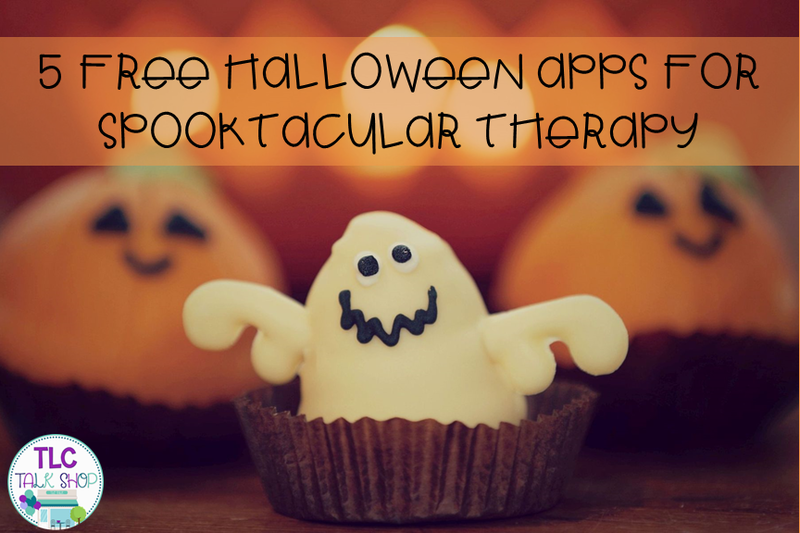 Do you know of any great, free, Halloween apps that can be used in therapy? For free advocate cards and a social story about Halloween, check out this oldie but goodie from us here at Speech Spotlight. HAPPY HALLOWEEN!